As leading specialists in the heating and cooling industry, Pro-Tech Heating and Cooling technicians understand the importance of selling and installing only the best products for our residential and commercial customers. As such, we choose only the most reputable and proven brands — so you can trust that your Pro-Tech installed heating and cooling products will be reliable, energy efficient and last for many years. With the goal of providing our customers with high quality and proven products, we can ensure premium performance, long-lasting reliability and a great match for your individual indoor comfort needs! 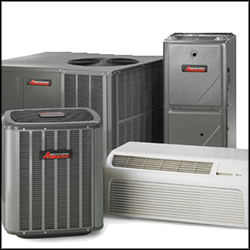 Our extensive product line includes items from Amana, Emerson Sensi, Bradford White, Aprilaire, Honeywell and Daikin. Each of these companies make top-of-the-line products that are guaranteed to go above and beyond for all of your heating and cooling needs. The reason for this is simple: Amana products go through the most rigorous quality and assurance scrutiny to ensure long lasting comfort for your home. Learn more about Amana products here. Enjoy the latest technology in thermostats — controlled directly from your smartphone! Emerson Sensi Wi-Fi thermostats keep you connected and in the know, no matter where you go or what the day brings. From across the room or across the country, use the intuitive mobile app to remotely control and schedule your home comfort — anytime, anywhere. Learn more about Emerson Sensi products here. Pro-Tech Heating and Cooling proudly sells and installs only quality water heaters — and the top-of-the-line Bradford White water heaters easily fit the bill. When designing and manufacturing their products, Bradford White goes above and beyond to create relaiable and efficient products using the latest technology. We understand the importance of purchasing the right water heater for you. Learn more about Bradford White products here. If someone in your home suffers from allergies or asthma, you already know the negative impact that polluted air can have. No matter how clean you keep your home, it’s likely full of harmful particles that can exacerbate allergies and asthma — and increase the likelihood of colds and flu. Aprilaire can help you control the purity of the air in your home with a whole-home air purifier. And unlike standard portable air purifiers, whole-home air purifiers are installed as part of your home’s heating and cooling system in order to effectively remove polluted air not just in one room — but throughout your entire home. Learn more about Aprilaire products here. Their thermostats are easy to install and conveniently work with your lifestyle. From standard thermostats to 7-Day Programmable thermostats to Wi-Fi and Smart thermostats — Honeywell has them all. Learn more about Honeywell products here. Daikin’s single zone units are ductless and great for heating and cooling small homes or individual rooms that need special attention. These units elevate the air in your smaller spaces and can also be used to supplement your current system. Learn more about Daikin products here. Choosing to work with ClimateMaster was easy — their geothermal heat pumps can reduce the average household’s energy cost by 80%, making it an intelligent solution for your home and your wallet. Learn more about ClimateMaster products here. In addition to have 100% confidence in these brand’s proven efficiency and reliability, our technicians have years of experience maintaining and installing these products, and can answer any questions you may have about them. For more information about the heating and cooling products from Pro-Tech Heating & Cooling, please contact us here or call us directly at 616.453.5000.